Almost a half century has passed since the inception of the People's Republic cf China. In that time a charismatic leader has ruled and died, leaving a wake of .Destruction in his quest to transform China. In that time, too, the PRC's most powerful ally and mentor, the Soviet Union, has dismantled and announced that jcmmunism had failed. Today, China fluctuates between tradition and modernity, ideology and pragmatism, between an antiquated collectivist ethic and a new spirit rf individualism. It is a country precariously suspended between past and future. 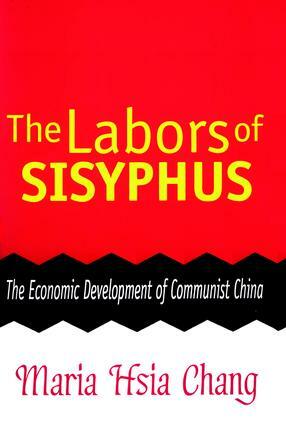 Maria Hsia Chang's The Labors of Sisyphus is a long overdue reassessment of rie meaning and purpose of the Chinese communist revolution. In it, she discusses ihe thought of Mao Zedong and Deng Xiaoping, reform and its dilemmas, regionalism in greater China and autonomous areas, and nationalism. She also eyjnines China's immediate present and uncertain future. If it manages to transform economic growth into development, China--filled with natural resources and a large, capable labor force--has the potential to become a world superpower. It could also collapse under the weight of its own problems: regionalism, a flawed state sector, corruption, and a pronounced decline in state capacity. If China succeeds, an imposing new economic power will enter the global stage, one that is often arbitrary and prone to despotism and xenophobia, unless it is tempered by political reform. Prior accounts of communist China have failed to capture China's evolving present In all its complexity and variety, misrepresenting Maoist China In the process. Information shortfall was partly to blame: as recently as August 1994, the Chinese government itself decried falsification of statistics by government officials and cadres. Sinologists in the 1960s and 1970s had to approach analysis of contemporary China with clear recognition of the limitations involved and the questionable validity of the factual sources available. Maria Hsia Chang lends structure, meaning, and purpose to the very complex recent political and historical past of communist China. With greater access to more accurate information, Chang is able to analyze objectively, without political motive or intention, providing readers with a fresh look at the People's Republic. Her pathbreaking work will be of interest to scholars of international economics and politics, sinologists, and historians.